Anxious or nervous about visiting the dentist? Not to worry! At Expressions Dental Care in Richmond Hill, we make it our priority to ensure each and every one of our patients are comfortable, relaxed, and calm when undergoing dental treatment. Do you get nervous or anxious about visiting the dentist or when undergoing dental treatment? Don't worry - we promise to take good care of you! We offer a variety of dental sedation services for patients to help them feel relaxed and calm when undergoing dental treatment. Your comfort is our top priority! Nitrous oxide sedation (also referred to as "laughing gas") is a sedation option offered to help patients feel more comfortable and relaxed during dental treatment. Nitrous oxide is a safe and effective sedative agent that is mixed with oxygen and inhaled through a small mask that fits over your nose. It is not intended to put you to sleep. You will be able to hear and respond to any requests or directions the dentist may have. Your dentist will ask you to breathe normally through your nose, and within a few short minutes you should start to feel the effects of the nitrous oxide sedation. Ultimately, you should feel calm and comfortable. The effects of nitrous oxide wear off soon after the mask is removed. Classified as minimal to moderate sedation, oral sedation consists of a pill taken approximately one hour prior to a dental treatment. Doses vary case by case, with the purpose of reducing a patient's fear and anxiety and making them feel comfortable and relaxed. As one of the most common forms of anesthesia for dentistry, this method will make patients drowsy but conscious, allowing for a dental treatment to be carried out effectively, while still keeping necessary lines of patient communication open in order to monitor comfort levels. After the procedure is complete, patients are advised against driving as the effects of the medication require some time to wear off. Therefore, patients must make arrangements to be transported home from the office by a family member or friend after their treatment. Intravenous sedation (IV) is a moderate type of sedation. We provide mild, moderate and deep IV sedation. Patients who have undergone IV sedation often report feeling like they slept through their procedure. Generally, IV sedation is used for shorter treatments. It is administered via direct injection into the bloodstream, which means the effects are immediate. Sometimes patients feel groggy and sleepy when the IV sedatives are withdrawn, and so they must arrange for a ride home with a family member or friend after their treatment. For patients who are extremely fearful of undergoing dental treatment, at Expressions Dental Care in Richmond Hill, we offer a VIP Lounge, which is a private space for patients to relax before and after their dental treatment. You receive dental sedation in this room and can have a family member join you, as you get comfortable. After treatment, you can sleep or continue to relax in this room. 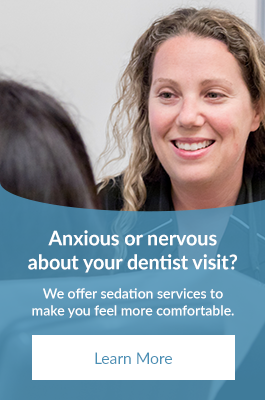 For more information about sedation options or our VIP lounge, contact us in Richmond Hill today.